We owe it to ourselves as truth seekers, concerned Americans and citizens to decode the meaning of the recent Charleston South Carolina Church shooting and see how the greater agenda fits in with the new world order plans. Just as globalist controllers won't ever let a good problem go to waste, so it is with truth seekers. We should never let a good false flag shooting, staged violence or political "reaction" to this violence go to waste. Let's take a proper close look at the reaction phase of the recent church shooting without analyzing the shooting itself. We'll find here that by considering just the reaction phase, this will tell a huge story. It is then up to us to determine where this agenda is headed. 2- Gun owner- All gun owners and 2nd amendment defenders are dangerous because they might be the next crazed shooter. 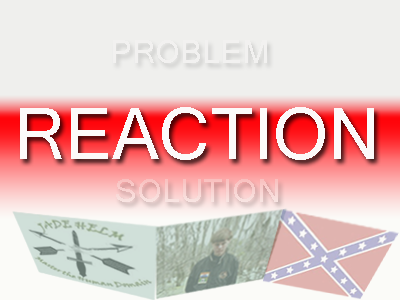 3- Confederate sympathizer- Look out for anyone who sports the Confederate flag or speaks in ways that indicate they are not sympathetic toward tyranny, the Union, the federal government or if they support state sovereignty or resist top-down control by a federal government- all of these ideas are to be seen as possible signs of that person being the next crazed shooter. 4- Lone wolf- Anyone harboring anger or stand-alone disagreement with any group, religion or political idea might be the dangerous lone wolf the federal government has been warning you about. 5. Racist- The new racism is no longer an individual thing and it's no longer a problem which has existed since before the birth of America. It now makes you a terrorist or the next mass shooter. That's right, if you hear someone expressing racist ideologies (especially if they are white) that might indicate that they are about to kill a bunch of black people just for the heck of it. More importantly, because of the racism problem everyone should distrust anyone who is not the same color as they are because that other person might be a crazed shooter or someone looking to exact revenge on your race. Beware and be afraid! These reactions are being fostered of course by government, politicians and the CIA's mainstream media. Add to that the ongoing subliminal demonization of Constitution supporters and what we have is an America that is being set up for war. The war is two-fold- First there is the external foreign policy related march to world war 3, then there is the war within which is starting to resemble shades of the civil war. The Federalists are back in the form of the globalist, and anyone against the U.S. dollar abroad is the enemy and will be attacked by their terror tool ISIS. Anyone at home supporting state rights, individual rights or freedom from the globalist control freaks is now seen as no different than those who supported the Confederate army in the south and will be considered the domestic enemy. The globalist have their hands full in a 2 sided simultaneous war. It should come as no surprise to anyone that throughout globalist scripted American history the Confederates have been demonized as "pro-slavery" by the Federalist to this day. They symbolized the resistance to tyranny, resistance to the north, to the federal government and resistance thus to today's new world order. They represent the will and force of the states against the Union. If it weren't for the fact that Jade Helm 15 is looming and that several states have spoken out against this U.S. military martial law exercise officially starting soon, we might be wondering why the mainstream media has gone out of its way to point out that alleged shooter Dylann Roof was photographed with a license plate sporting the Confederate flag. This is just another of many recent hints and subliminal suggestions that Jade Helm 15 is an ominous event in motion. What we are seeing with the recent mass shooting is a very well coordinated and predictable reaction phase which should set off a red flag in the minds of every truth seeker who is familiar with this very often repeated government script. The (mainstream media) reaction phase is so familiar to many of us that it almost feels as if there should be a criteria for automatically labeling a shooting a false flag without the need for any evidence in cases where the reaction phase and especially the predictable 'solutions' make it so blatantly obvious that the known agenda is at play. In a world divided by those who believe in organized coordinated conspiracies (simple reality) and those who believe all events transpire by wild coincidences (mainstream media believing non-conspiracy/coincidence theorists) it is easy to harass and show up coincidence theorists just based on the repeated and predictable occurrences of these well coordinated conspiracies which always support stated and known agendas. Repeatedly exploiting the cerebral capacities of coincidence theorists however rarely puts a dent into the globalist plans. Unfortunately the waking up process is both painful and slow. Most people are not prepared to accept the horrific reality of our world at an instance. Despite these information battles which we fill our days with while trying to expose the controllers, there is still the reality of their plans to deal with. The fact is that reality and fiction is now headed toward a massive collision of human consciousness. Many will die not knowing, many will die trying to fight it. Some will witness the truth and humanity will carry on with this new fund of knowledge about who we really are and where we are headed. Truth versus lies, life versus death, coordinated conspiracies versus the blind belief in wild coincidences. It's all unfolding now. The great hope is that enough of humanity will come together, as is already happening worldwide, and say no to the new world order, their staged and funded terrorism and their corrupt politicians who will have to be replaced one by one. We are now in a revolutionary period in every sense of the word. If members of the public are obedient then they will more easily relinquish their guns and all their rights. An unarmed public is the perfect scenario for the controllers because they can do as they wish moving forward including mass genocide and depopulation and that is the reason for the recent gun control agenda revived with this latest shooting. So as the control system is already putting out subliminal ads intended to criminalize those who support and defend the Constitution (see video below), let's keep this latest shooting in mind because the reaction phase (and of course the proposed solutions) fits right into this agenda. The main purpose of Jade Helm 15 as stated by the U.S. military themselves is to "master the human domain" and this is all you need to know. To master the human domain one must first master and control their mind with fear, then one must disarm them. Intimidating Americans and forcing them to do things they don't want to do- this is the main purpose of the Jade Helm 15 psyop. Arm yourself mentally with knowledge, understanding and courage to do what is right. Then peacefully, wisely but firmly reach out to others who don't understand what is happening. Hold your local politicians accountable for their actions. Educate the military and those in position of power. Then be still and act with purpose not fear. Look for the light at the end of the tunnel. Remain hopeful. Find your place in history. Read more history so you can understand the current days and more importantly the future. Decide what you believe in then live for that cause. Just remember, living and dying is the story of humanity. Everything that happens to us are but stories being told. Ask yourself, what is your role in the story?